I'm ... writing ... to inquire about historic artifacts that were recently unearthed in the Cape Horn area. These artifacts are: NUMEROUS (hundreds?) Buddha Head figurines all ranging in size from a dime to a silver dollar. These Buddha heads were obviously poured from original carved castings, the material is extremely dense and polished and has the consistency and finish of fine porcelain or polished ivory. There are several hundred artifacts most of them Buddhas, but also there were other figures approximately the same size, these other figures included porcelain "seashell shapes", conical shapes, "button shapes" with colored enamel overlays including red, blue and emerald green. We are attempting to identify, date and determine their origin and what these pieces were used for. It is speculated that they were used by the chinese for gambling since they were not allowed to possess gold? No one has been able to identify them or even show other examples of like pieces in the Chinese camps during the gold rush era. Here are a couple of photos of the pieces that I have. So far I have identified approximately 8 different unique pieces. 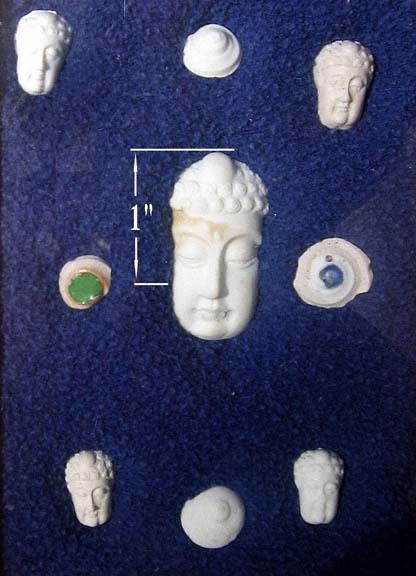 Each of these pieces is complete and unbroken (not part of a larger piece), except the "half" Buddha face piece in the picture which represents the largest shape of the "set." The one that is next to the "1" is a complete piece and is the largest of the pieces. The backside of each piece clearly indicates that these pieces were "cast" or poured from porcelain or a similar very dense hard material. ... Out of the several hundred pieces I've looked at, it appears that that there are dozens of "original" molds for each shape. 1) Origin: Were they cast here or in China. How old are they? 2) Did other Chinese camps in the gold country use these same pieces or were they exclusive to the Cape Horn camps / area? 4) Are there others out there? "Their wages, which are always paid in coin, at the end of each month" ... "They are paid from $30 to $35 in gold a month". These were found way down by the American River in Robbers Ravine. there is no chinese writing or inscriptions on ANY of the artifacts found. The back side of each piece is flat or has a slight depression similar to pottery or slip castings after it has dryed and baked. No markings. I do however find it interesting that this buddha is not the traditional "fat happy buddha" typically found in Chinese religion. But It's possible that the happy buddha became popular later and this "japanese style meditative buddha" was cross cultural in the 1800's? What a valuable find and in such large quanities. I have forward this information to a Mr. Paul Chase a known expert for Chinese artifacts and member of CHSSC. It may be possible that the "Buddha" figures may be Quan-Yin, Goddess of Mercy? I will discuss this with others. Looking forward to any other info. Just an update, the person who found the original cache graciousley took me back to the location this morning. Since Northern California has recently had a huge storm, the American River shows signs of high water being 15-20 feet higher in the past couple of weeks, altho it is back down now, but still running very fast and COLD. I searched downstream from the original field of buddhas and found one more of the small buddhas in three hours. So, I do believe the find to be authentic. But just hyow long these artifacts have been in the river and their origin is still a mystery. Another observation! There appears that the green stone is high quality Chinese Jade with a gold rim. Very valuable considerating age and quality. no jade...no gold....there are only three "styles" in the collection that have anything at all on them. But, those little blobby shapes ( I call button shapes) are just little "domed" blobs with a "blotch" of green or red enamel glaze on it. some of the enamel blobs are big, some are small. Indicating they were applied by paint brush or something similar and then fired. SO - there is NOTHING else on any of the artifacts. 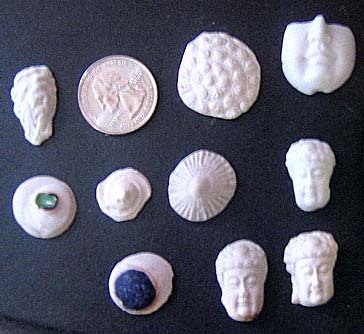 I have received information that an east coast collector has identified these artifacts as "possibly" 12th century ivory and porcelain pieces originally from Thailand. They are allegedly from a game that was played with over 800 pieces and that only two other complete sets are known to exist in the world. There is also supposed to be a book that talks about this game with photos... if anyone knows of this book, I'm trying to locate it. This collector who is coming to Colfax from the east coast presumably has placed a value of approx $2000 for the small pieces and over $7000 for the large Buddha heads. Again, any further info or insight is appreciated. Caveat Emptor! – Caveat Venditor! Interesting "find.' It amounts to theft, and if the Burea of Land Management finds out what has happened, they may become interested. I for one am very tired of people looting archeological sites. The Chinese were, of course, allowed to own gold, in fact, in the immediate vicinity of the discovery, and before the CPRR arrived, there were major Chinese camps all up and down the North Fork, and other rivers in the Sierra. They were mining gold. In the debris piles left by the shameless looters of Dutch Flat's Second Chinatown, one often sees little black or white or green dollops of porcelain, exactly like some depicted in your photos, and I have always assumed that they are gambling tokens of some kind. Paul Chace may indeed be able to shed light on these artifacts. So far as the appearance of the Buddhas, there were many conventions followed in depicting Buddha, in China of the 1860s. Not just one fat and happy Buddha. It is an error to characterize your Buddhas, stolen from Robbers Ravine, as Japanese, unless indisputable evidence confirms that. The Chinese Historical Society might be a worthy organization to donate these finds to. Or, the Placer County Museum. I will inform the Bureau of Land Management of the "find" immediately. I am looking into the possibility that these artifacts may have been part of Sturlas lost possessions. I may not be able to prove it coclusively, but if I can prove that these were manufactured in the Machao Province in the 40's or 50's.. it would be the most likely scenario. I take great offense at your assuming that these artifacts were looted or stolen. Before you go making such accusations, maybe you should do some serious investigation of your own.I cannot postively confirm the exact location of the find, because I wasn't there when he found them. But I would never accuse anyone of theft or looting unless I could prove it. I am convinced however that these pieces were discovered while legally searching for gold. The person who found them has already offered to donate or loan them to an appropriate museum if they are in fact of historic or cultural significance. Fact: Where would these pieces of art & history be if they weren't discovered when they were? Gone Forever? Fact: I wonder if Mr Sturla (also a prospector) may have LOOTED them from Dutch Flats second China Town in the 50's??? In light of your information about the "porcelain blobs" found there, it makes me wonder. Maybe Mr Sturla was the thief!!? I'm luvin it and I suppose every good story needs at least one villain. Well, I guess I should have seen that coming! Yesterday afternoon (2/22), federal agents, BLM archaeoligists and the sheriff raided my store and seized (without a warrant, court order, nuthin) the 15-20 artifacts (buddhas), that I had aquired from the prospector. It seems that Mr Towle convinced "the feds" that they had been looted... So without any proof or conclusive evidence of that EVER have happening, they turned ME into the bad guy thanks to Russel Towle. In any case, i hope that now I will be vindicated as the guy who was in search of the TRUTH as to where these originated, and thanks to mr Towles confession that he had located blobs of porcelain in the dutch flat chinese camps "exactly like" these, I am confident now that the 500+ buddhas that were recently discovered came down river in the 1950's (in a container of some sort) from Louie Sturlas house that was destroyed in the flood of 57 (56?). Louie Sturla collected these just like Mr Towle has... and I'm out to prove it. Hey Russel, did you turn yours over to the feds? Are they in a museum where I can check them out to compare? Be careful what you find in your own back yard...If it is a "fossil or any artifact of historic or cultural significance" the United States government can walk into your home and take it" without any court orders or seizure order or anything.... just "probable cause".... I didn't even get a receipt! Suggest consulting with an attorney. "The Federal Government, as well as every state in the Union, has numerous laws governing the status and protection of historically significant lands and objects within their jurisdictions. Objects over 50 years old come under this definition, and so care must be taken when treasure hunting, or laws may be inadvertently violated. It is wise to familiarize yourself with these laws before beginning a treasure hunting adventure. Here is a good source for the 1906 Antiquities Act. I suggest doing a search for "Antiquities Act" for the particular state you will be working in to get the proper information." Re the little buddhas found swimming in the American River: the lesson here is to button your lip lest busybodies sic the Feds on you to confiscate your find! What a nasty creature that Towle thing is. Overgrown tattletale and busybody who accuses without evidence, troubles without conscience, harasses without decency. I wish him the worst. Today (2/26) I visited Dutch Flat where the friendly locals put me in touch with Russell Towle by phone. I asked if there was any chance that I might meet up with him or someone else that would allow me to compare those artifacts found (2005) with the artifacts that he claims to have been discovered in the Dutch Flat China Camp #2 (see previous post). I was however welcomed by Mr Ricker (another local historian) who drove up and met me at the Dutch Flat Museum. (neat place - lots of history) He was kind enough to open up the museum and go through several chinese artifacts on display there and dozens of textbooks and articles written about the Chinese in the area. In the time i spent there, we were not able to find anything that eluded to evidence of these artifacts existing in the Chinese Camps. If there has indeed been artifacts found, I would hope that Mr Towle would be willing to help in this investigation to prove or disprove it since a man was arrested over it. While I am still optimistic that these artifacts may still be circa 1800's or older, I am now having serious doubts about the Dutch Flat connection. The State is currently conducting there own tests to determine the approximate age of the artifacts. If I hear anything, I'll let you know. I do have an objective pro's and con's paper that I wrote if anyone's interested in reading it (jimbowers@foothill.net). You might better form your own opinion after reviewing it. Chris Graves says that tomorrow's Sacramento Bee will report that the actual source of the Buddha heads is a Sierra College professor who made 500 of them and littered them all over the canyon in order to "spread some karma around." The Sierra College's Ridley Art Gallery had an exhibit, "Short Order: Ceramic Work by Casey O'Connor & Richard Shaw," Oct 26 - Nov 18, 2004. Casey O'Connor is Department Chair of the Sierra College Art Department. You may recall that in January, 2006, Mr.Jim Bowers, owner of a T-shirt shop in Colfax, Cal. posted a note on the blog re: 'Chinese porcelain Budda heads' that were found in the bottom of Robbers Ravine, where that Ravine meets the American River. Mr. Bowers was attempting to find a reason for the Budda heads being there. Mystery solved! In the March 4, 2006 Sacramento Bee, (tomorrows edition) it will be revealed that an art teacher from Sierra College, Rocklin, Cal., had an idea that it would be nice to spread good karma, and to do this, he would sprinkle a few hundred Budda heads in the bottom of Robbers Ravine, this where that ravine meets the American River..........so, Pilgrims, we now have a new definition of 'good karma'. I fear that the Budda heads will join the legion of legends that already surround Cape Horn, joining in such company as the Baskets of Stephen Ambrose; the sudden deaths of Chinese workers scrambling away from black powder explosives, and the Lost Locomotive that is yet to be found in Burnt Flat. Ah, the perils of history. Story is out, front and back pages of todays Bee, complete with pictures. "Art professors are creative, but they don't have the most common sense in the world." To tell ya the truth... I'm a little impressed. Working on a tip, I contacted Sierra College early yesterday morning. They put me in touch with the art dept who put me through to Mr O'Conner. Up to that point, he had not been contacted by the feds or anyone to confirm that he had in fact created the Buddhas. I asked him if I could ask several very specific questions that only the person who created the artifacts would know. The only people that deserve any blame (or shame) in all of this are the Feds and State for treating me like a criminal when I was very public about my attempt to protect the find if in fact they were historic. (and they tore Henrys home apart more than once looking for buddhas). A few reporters that left important facts out and printed innacurate details. And finally.... Mr Towle who, put an innocent man in jail and cost taxpayers a ton of money only to find out.... there never were any of these artifacts in the dutch flat chinese camps. I'm giving a talk on the whole Buddha story at Camp 20 Coffee House - April 7th at 7:30 PM in Colfax. It's a free event. The prospector is going to be there and O'Connor will be givving a "small gift" to all those in attendance. Some of it will blow your mind..
Hope you can make it. Please introduce yourself if you can. It is quite an interesting story of Mystery, Greed, Government Power, Lies and deception. In the end, you too will be truely enlightened and you might come away from it with a gift from the professor O'Connor. "500 Buddhas" Film Project. After my last lecture at the Miners Foundry in Nevada City, i was approached by Jim Weber from SFMOMA. (San Francisco Museum of Modern Art. Jim approached me about doing a documentary film about the Buddha story. They have since been up to Colfax to scout locations and "meet the players". The project is moving ahead! I am doing another (filmed) lecture on July 14th at the VFW hall in Auburn. If you are interested in hearing the REAL story of the 500 Buddhas of Placer County, I'll be doing another free lecture at the VFW Hall in Auburn on August 11th Friday at 6:30 PM. Film crews will be present to document the lecture for an independent film/documentary being made for PBS, film festivals etc. Depending on the number of attendees, I will be "gifting" Buddhas to all. "Art professors are creative, but they don't have the most common sense in the world." — Placer Co. Sheriff's Office. Yes, and sometimes "well-meaning" law enforcement can come out looking dumber than dirt. These Buddhas that they have unearthed look more like the Buddhas found in Thailand, Laos, or Cambodia. How it got there will be hard to explain. Unless there were traders that sell these to the people in Cape Horn. No, you are being gullible about a hoax that is already solved: they were created and put there by an art professor.